I’ve written a tutorial showing my step-by-step process for how I painted this dresser. As you may remember, we’ve been renovating our house the last few months, and while the contractors are gone, we’re far from finished! Though, now we can finally see the end is within sight. This summer has been all about painting. Trim, doors, walls, cabinets and lots of furniture. 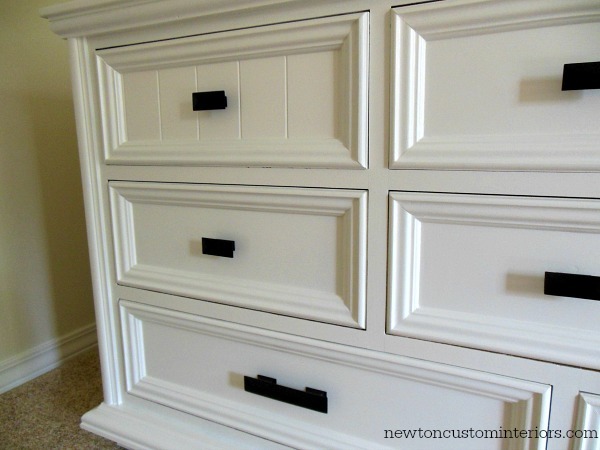 Today, I’m going to share with you a dresser makeover I recently completed. This dresser originally belonged to my dad’s aunt and uncle. It’s part of a three piece set, and is a really nice, heavy piece of furniture. This bedroom set was in my daughter’s room until a couple of years ago, when we moved it into our master bedroom. Unfortunately, while it lived in my daughter’s room, the top of this long dresser was the victim of some pretty bad water damage. Somehow, with all of the before pictures I took, I managed to forget to take a picture of the top of the dresser. You can kind of see the damage in this picture. In the center of the top it’s not quite as shiny. I’m going to write another post soon to explain the prep, sanding and how I painted the dresser. Today’s just about the before and after. The two top drawers had this funky, plastic faux wicker thing going on. So, I switched it out with some extra V-board that I had leftover from our kitchen peninsula. (More about that soon). I love how the v-board and the new hardware update the look of the dresser! I added small pulls to the smaller drawers and the larger sized pull for the bottom drawers. Here’s the before and afters again. You can also see some of the other changes that have been made in our bedroom – baseboard trim painted white, new wall color and carpet. I love how light and bright our bedroom is now! I decided that I liked the dresser better without the attached mirror. (Not to mention, I didn’t feel like painting it!) So, eventually, I’m going to have a gallery wall above the dresser. Stay tuned for the 411 on how I painted this dresser, and many more furniture projects! Have you done a furniture makeover? How did it turn out? That is beautiful. Can’t wait to see how you prepped and painted it. Hi, I love the new dresser! Where can I find your blog on how to do it myself? Kaitlin, there’s a link to the painting tutorial at the top of the post. Great job! 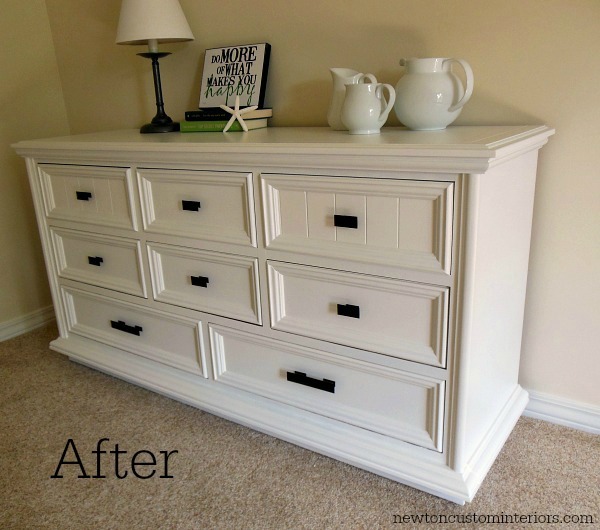 I’m thinking of doing a similar item so will be looking forward to just how you prepped and painted the dresser. Thanks for sharing. Thanks Bobbie! It will be coming soon! The dresser looks great! I know how much work that was because I did Laura’s old maple bedroom outfit. It is amazing how much just changing the hardware updates old furniture. I followed all the steps the paint store advised, but we are finding Laura’s furniture has a couple of chips. Is your paint holding? Only thing I can think was wrong with Laura’s is—it was so old and has had so much polish on it that washing with TSP, sanding and oil base primer was not enough. Any thoughts? Hey Jeanette! Ours is holding up well. Those are the steps that I followed too. I did use a TSP substitute which is a liquid, not a powder. It was recommended to me because a lot of people don’t rinse the regular TSP very well, and then you’ll have problems. You don’t have to rinse the TSP substitute, but I still did. What paint did you use? Thanks Kim! I have been well, thank you, just extremely busy. I do love how the dresser turned out. Love the transformation! Please share where you found the “do what makes you happy sign”. Thanks Judi! I found the sign recently at a local Meijer superstore. I LOVE this project. I have an old dresser that I’m trying to get the kids to help me refinish. Thanks Elayne! Good luck with your dresser project. It’s a lot of work, but well worth it! Jann, Wow! Looking at both dressers… oops, I mean the one dresser in the before and after photos, I would be sure it was 2 different pieces of furniture! Amazing job! Thanks Jill! I’m so happy with the updated look! It turned out lovely! I’ll be bookmarking your page for when we get moved & I start all my projects! Thanks Morgan! Good luck with your projects! I guess, this is my first to visit you and I surely know that this is not my last. So much ideas and all your talents is really amazing. 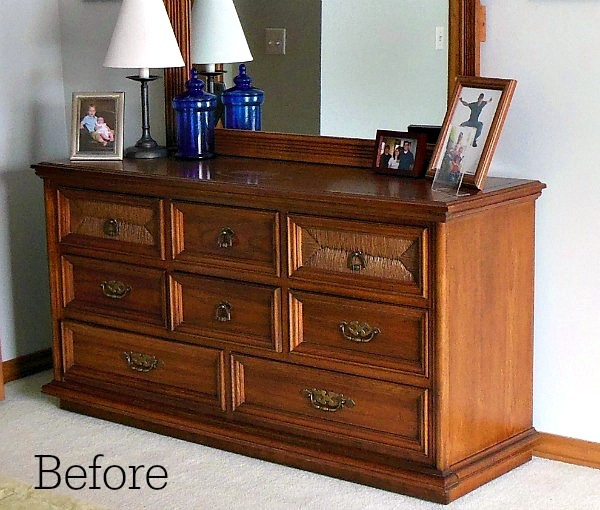 TY for sharing your re-doing your dresser. Honestly, I have one that still waiting for me. Hope you’re grabbing me to do re-do it… SOOON! what a wonderful transformation! I am always amazed at what paint can do! Thanks for sharing!!! Is there another post where I can see how you replaced that wicker stuff? My dresser has them all over and I need to get rid of them asap! Lol. THANKS! 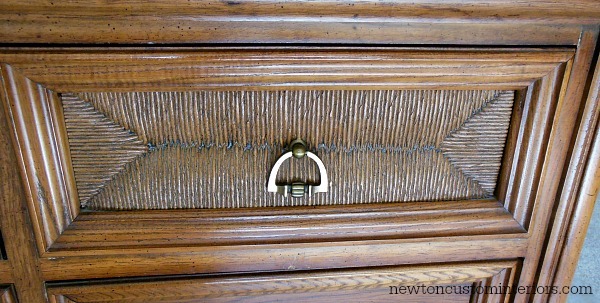 Angie, I just unscrewed the faux (plastic) wicker pieces from the inside of the drawers. 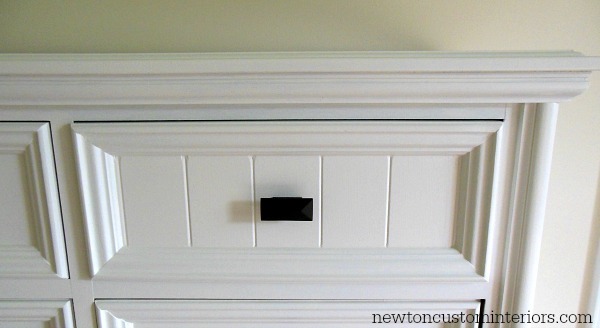 Simply cut out pieces of beadboard the same size and then screwed them in from inside the drawer. If yours are real wicker and not the plastic, then I’m not sure how you would replace them. Maybe the same way? I didnt see the directions on how you did this..
Dina, there”s a link in the box at the top of this post. Family and friends have said that they are addicted to Pinterest . Today was the first day that I logged on and happened on your great tutorial. I believe I will be addicted to Pinterest. Thanks so much. Wow, thanks Barb! Pinterest is addictive, but I love all of the great info you can find there! Where did you get the pulls from? Dresser looks great! Thanks Sarah! There’s a link at the top of this post to the post where I give directions for painting the dresser and I also tell what hardware I used. Turned out beautiful. Where did you get your hardware. Have a dresser that I’m converting to an entertainment stand and those are the closest I can find to what we already have on other furniture in the room. Thanks Robin! If you go to the very top of this post, there’s a link to my How To Paint Furniture post. 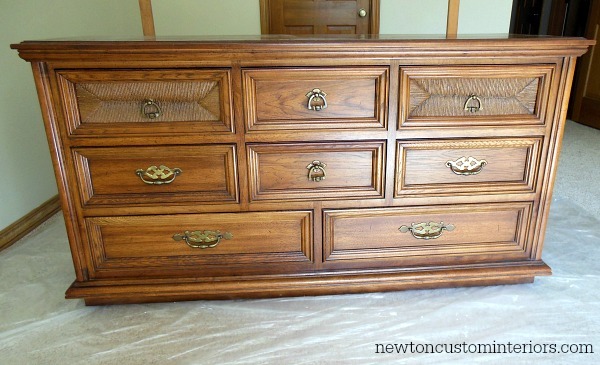 In that post I show how I painted the dresser, and I also give more information about the hardware. Good luck with your project! I saw your dresser on Pinterest and decided to paint dining chairs. Sanded one chair with a circular sander, then applied two coats of zinser,lightly sanded that. Then applied one coat of BM semi gloss paint. With a small foam roller. Unfortunately it’s not as smooth as I wanted.i don’t know what to do. I’m not sure without seeing the chairs in person. Did you sand in the direction of the wood grain? Also, I’m not sure that applying two coats of the oil primer is a good idea. I usually only apply one coat, and then lightly sand and apply two or three coats of the paint. Did you use the BM Advanced paint?